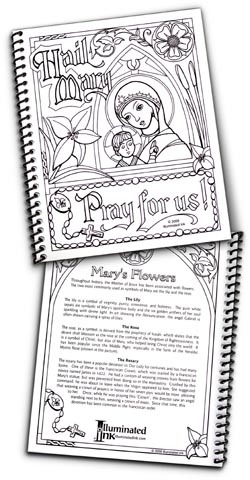 The cover of this beautiful 'Blank Book' features an outstanding illustration of the Blessed Virgin Mary by Kevin Butek and is printed on a heavy-duty white cardstock. It is easy to personalize with colored pencils, markers, paint or crayons. Each book is spiral bound, and the back cover provides a detailed explanation of the symbolism used in the illustration. Each book measures 5 1/2" x 6 3/4", and contains 25 blank white pages of heavy, 24lb paper.